Needlepoint is one of the easiest crafts to learn. 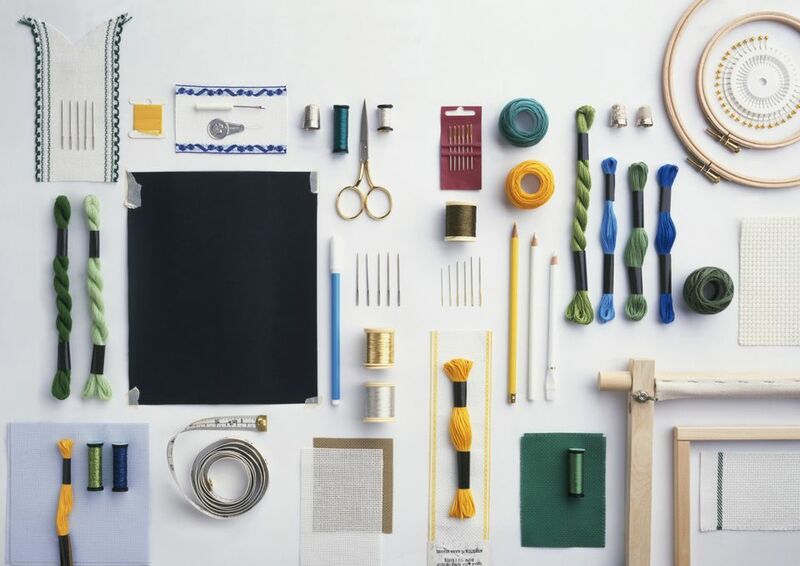 To get started, you only need five essential supplies to stitch up your first project. Once you’ve mastered the basics, you can enhance your stitching experience with eight additional gadgets. Advanced stitchers who wish to take their needlework to the next level and design their own projects should consider seven more vital tools as well. Every craft requires basic tools and equipment to start and complete a project. For needlepoint, there are five essentials. Needlepoint Canvas, Pattern or Chart – Beginners usually start with a design already painted on canvas or a machine-printed one in a needlepoint kit. As you gain experience working on needlepoint projects, you can progress to using patterns or design charts with a blank canvas. Assorted Threads and Fibers – Needlepoint requires specific yarns and fibers. These threads must be strong enough and able to withstand the constant pull and tug as you place stitches on the canvas. Tapestry Needles – Blunt-tipped tapestry needles are necessary for working on needlepoint canvas. They come in several sizes that match the ground fabric you are using for your project, and do not puncture or split the mesh threads as you stitch. Although the needle eye is larger than a typical sewing needle, you can use a needle threader if you need extra help. Embroidery Scissors - To clip threads and cut yarn, you'll need a small pair of sewing scissors with sharp points. Consider buying a pair of nippers or specialty cutters if you like to stitch needlepoint while traveling. Lighting and Magnification - Tiny canvas holes and certain thread colors can be difficult to see in dim light. So make sure to have adequate lighting as well as magnification when working on your project. A lamp that simulates daylight and a pair of extra-strength reading glasses work best. Stretcher Bars or Frames - Experienced stitchers use artist stretcher bars or scroll frames to mount needlepoint canvas and keep their hands free to do surface embroidery, add embellishments, and produce professional-looking results. Masking Tape - Needlepoint canvas edges are rough and require some covering to keep the mesh threads from unraveling. Household masking tape and blue painter's tape are ideal wrappings for protecting these edges. Brass Tacks or Staples - You can attach a canvas to stretcher bars with brass thumb tacks, evenly spaced for sufficient tautness. Mount needlepoint on a frame with rustproof staples or hand-stitching. Magnets - Most craft stores sell sets of small painted magnets for needlepoint. You can use them to attach extra needles, scissors, and other tools to the frame or stretcher bars for convenient stitching. Floor or Lap Stands - Perfect for stitching larger needlepoint projects, you can choose from lap or table stands to adjustable floor models that provide the most comfort. Use a clamp or frame weight to fasten a project to a table or counter. Ruler or Measuring Tape - Use at least a 12-inch ruler or a flexible tape measure that has both standard and metric sizes. Waterproof Markers - For help finding the center of a canvas or drawing an outline of a design shape, use permanent waterproof markers. Avoid black or other dark colors as they may show through your completed stitching. Project Bag - After gathering all the supplies you need for a project, you can keep them together in one place. Plastic or cloth bags, wooden boxes or crates that fit the size of your needlepoint projects are excellent storage solutions. Laying Tool - If a needlepoint project requires stranded thread, then you should use a long stick-like tool or trolley needle to smooth the strands before placing a stitch. Laying tools are usually made of wood or metal and can be plain or decorative. You can buy them from needlepoint shops or online boutiques. Blocking Board and Pins - For DIY finishing, you will need a blocking board and rust proof push pins to stretch a completed canvas back into shape. Thread Bobbins or Cards - To keep leftover threads from previous needlepoint projects neat and tangle-free, you can store them on bobbins or cards. Group colors or textures together and put each collection away in clear boxes or drawers. Needlepoint Design Books - Browse through needlepoint books to get fresh new design ideas. Visit your local library or used bookstore for the classics to start a personal collection. An Assortment of Acrylic Paints - You can learn to paint on canvas and take your needlepoint to the next skill level. Use water-based acrylic craft paints for filling in shapes or making changes to existing hand-painted designs. Lightbox - This tool works well for tracing patterns from coloring books and similar sources. The lightbox will illuminate the design so that you can make an outline on needlepoint canvas. Needlepoint Pattern Software - With needlework computer software, you can turn photos and clip art images into workable charts–a "Must Have" for creating your personal designs.